Waste Disposal from commercial properties including pump treatment plants, grease traps and gullies. Vacuum Excavation for safe excavations in sensitive no dig areas. Build Over Surveys for house extensions over or near to drain runs. House Purchase Survey ensures that there are no nasty surprises after you have purchased your property. Problem Solving for both foul and storm drainage systems. Domestic Unblocks in Gloucester £70 plus vat. Deltamec Pumps, pump servicing and replacement. Drainage Repairs including patch liners. Percolation Testing also called porosity test. Area Covered, Gloucestershire, Herefordshire, Worcestershire, South Wales, Wiltshire, Avon, Somerset. 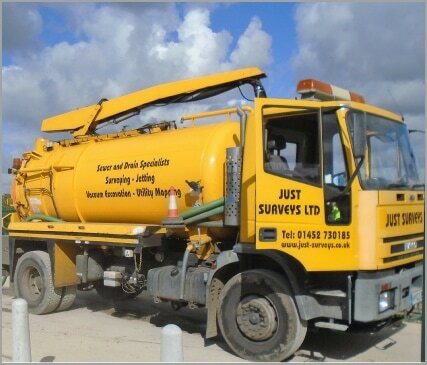 Welcome to Just Surveys Ltd, we are here to find a solution to your drainage problems. After investigation to establish your problem, we will work with you to find an economical solution. If your drains are running slow or you have unpleasant smells, you may be in need of some drain maintenance. We can jet your drains to break up potential blockages and keep your drain running freely. Although we are mainly a surveying company, we have the staff and tools to offer a service to the local community that is both honest and convenient. We are members of the NSA and our surveyors are certified to NADC standards and trained to WJA standards in jetting. "May I take the opportunity to thank you for your swift and efficient processing of this survey – and it was also a pleasure to meet your operative Sean on site who was very friendly and knowledgeable about his subject matter. Please extend my thanks and best wishes to him." "Great service and a professional approach to our issue. The follow up from Sean made this difficult situation go away. I would recommend this company to anyone."